Here are the decklists PokéStats has collected from League Cups over the past weekend. 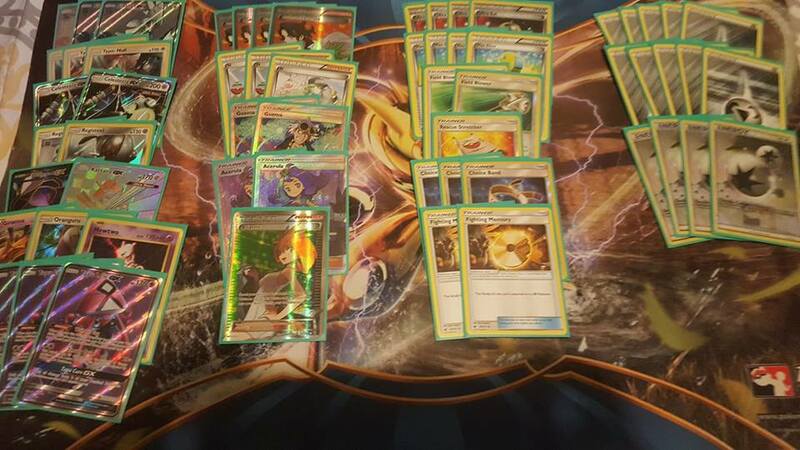 "Mew is good for the mirror, the list definitely needs an Acerola though. Mewtwo EVO takes a DCE to get powered up; I like Mew because it can use Buzzwole's and Zygarde's attacks." 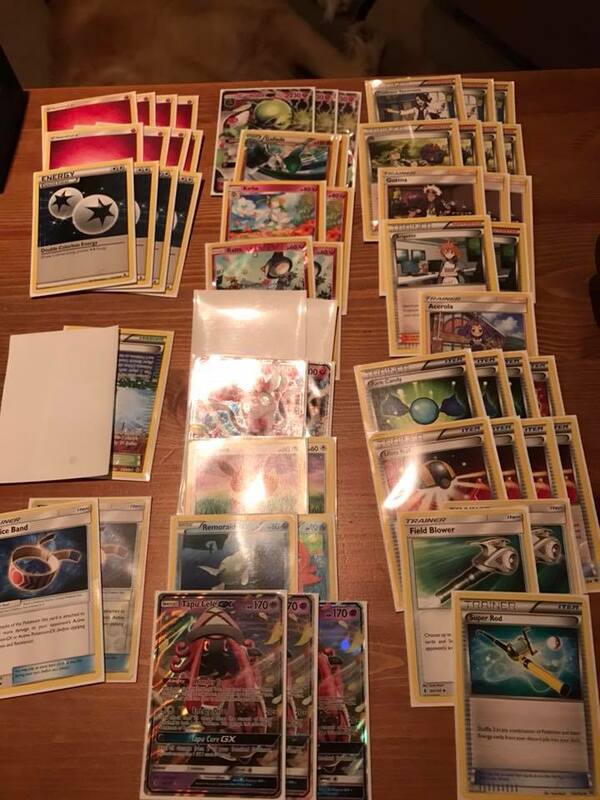 "I like the deck but volcanion is definitely a tough matchup"
On Zygarde-EX: "I used it maybe one to two times throughout the day, after playing it today I would add another Regirock-EX, 4th Guzma, or an Acerola over the Zygarde"
"Sudowoodo was clutch, good in the Gardy matchup and can be used against Bulu and other decks"
"List is pretty tight, so not much room to get too techy, but, Buzzwole is hard because it puts on so much early pressure. Lost in top 8 to SHADOWSTITCHSHADOWSTITCHSHADOWSTITCHSHADOWSTITCH"
On Evosoda: "it serves a lot of utility in that you have many targets for it, and resources are valuable, so you don’t want to always use ultra ball to grab the Evolutions when you have some pop in your hand"
"I’ve found space is a huge issue with the deck because of the number of moving pieces involved. Would highly recommend Special charge because Enhanced Hammer exists. CB is amazing in certain matchups, but, we have Hollow Hunt as an option as well, so we can get one of those back if need be, so I didn’t feel the need for 3." "I like baby Zoroark because it can give you an option to get heavy things out of the Active along with an efficient attack that even if it doesn't take KOs, can put on good chip damage for future KOs, and help force the 7 prize game. 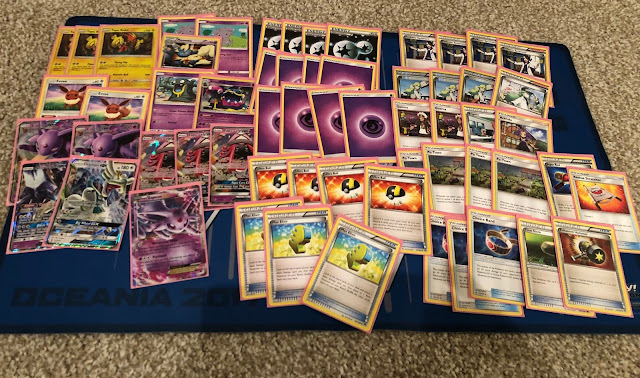 Mewtwo was not used for anything other than Buzzwole, but Buzzwole is a very hard matchup, so I will take what I can get in terms of what can help me out in that one." "Buzzwole has to overextend to one shot [Mewtwo], or you're forcing them to use the Guzma on other stuff. 70 [Mr. Mime's HP] is super easy for Buzzwole to hit with just 1-2 Energies"
"My teammate Draydon Davis who helped me with the list got 5th place, the only difference between our lists being a Zoroark GX line instead of an Octillery line. The blank sleeves are a 2nd Parallel, as well as 2 Psychic Ralts. 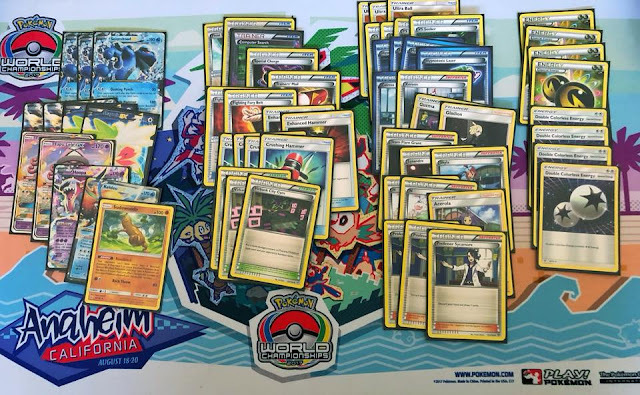 The reasoning behind playing Sylveon instead of Max Potions was because we expected a decent amount of DeciZoro as well as Lycanroc/Buzzwole, and it also helps make Metagross much more winnable." 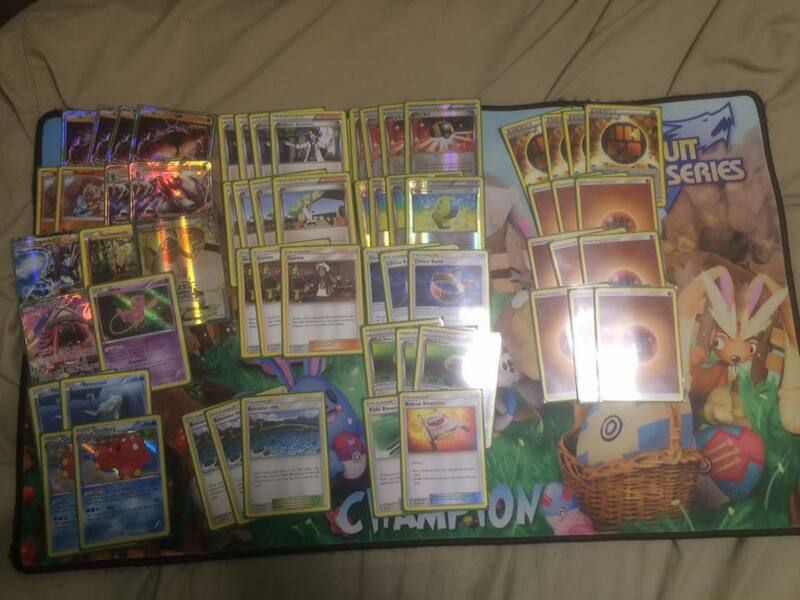 On the 1-1 Garbotoxin: "It’s terrible, I literally only played it because I couldn’t find a fourth Klefki. Maybe with more refinement the Garb could work due to Klefki's Ability but I'd have to test it a lot"
"I wanted to play Giratina [promo] and 4 Klefki but couldn't find the fourth"
"I just ended up throwing stuff in there"
On the single Field Blower: "It's not a matter of greed, it's simply a matter of deciding what is necessary for the deck to function properly in the meta. It was not a choice I made lightly, but it's a choice that has continued to not do me harm throughout current play. Should things shift into a position in which tools/stadiums because more troublesome such as a re-surge in garbotoxin, I would certainly be adjusting accordingly." On the 4-2-4 Metagross line: "It's not terrible but I'm thinking I'll up it [to 3 Metang]"
"I tried Mimikyu but never used it. 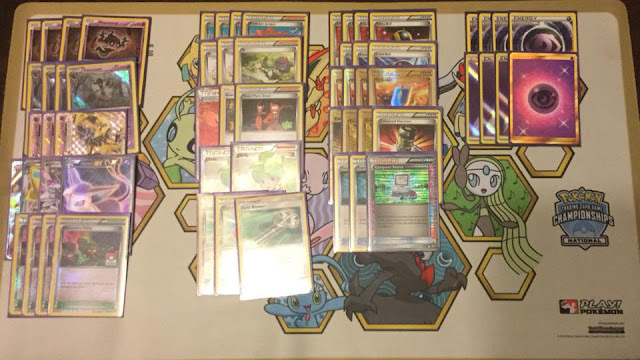 Double Necrozma was much better"
"I've hit two Top 8s and three Top 4s in the last three weeks [with this list]... the same [list] also finished 1st at 2 Cups within the past 2 weeks"
"Overall the deck ran very well all day, the only change I would make is to find some room for a 3rd Fighting Memory in this Zoroark heavy meta. It has good matchups and a lot of versatility. I chose to play Mewtwo over a psychic memory since it's easier to get in play and can deter opponents from loading up a really big Buzzwole." Top 4 - Zoroark Golisopod WLL"
"Kartana is very valuable against Buzzwole, Slice Off on a Strong Energy can set them back quite a bit. And Celesteela's resistance allows it to soften the blow of Jet Punch." "Against Volcanion I was struggling to set up, by the time I got rolling he was too far ahead." 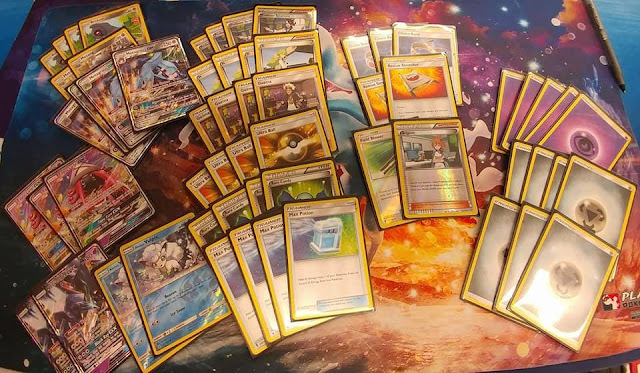 Carly Clements and Zak Andrews played similar lists to a Top 4 and Top 8 finish, respectively, at the same Cup. 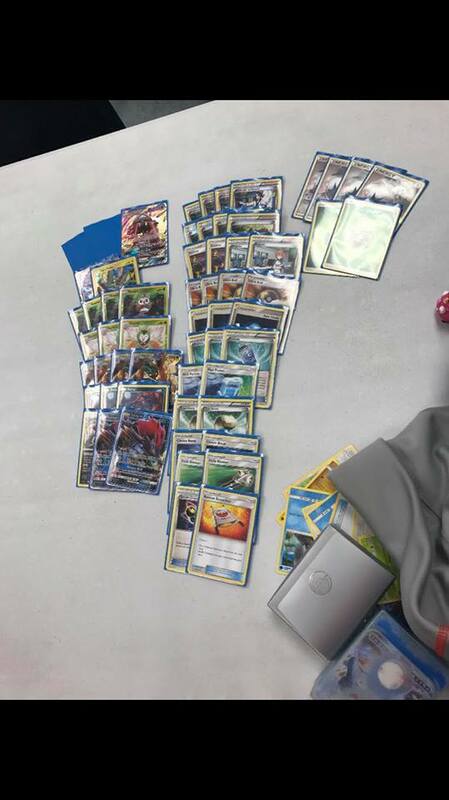 "My list is only 1 card off of the Limitless list (I cut a Tapu Lele for Shaymin). 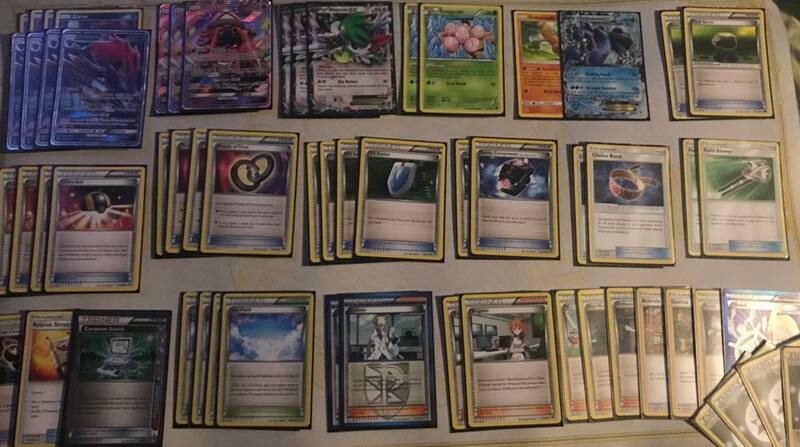 Xerosic, Delinquent and either another Shaymin or another Lele are cards I want to try and add in the future. 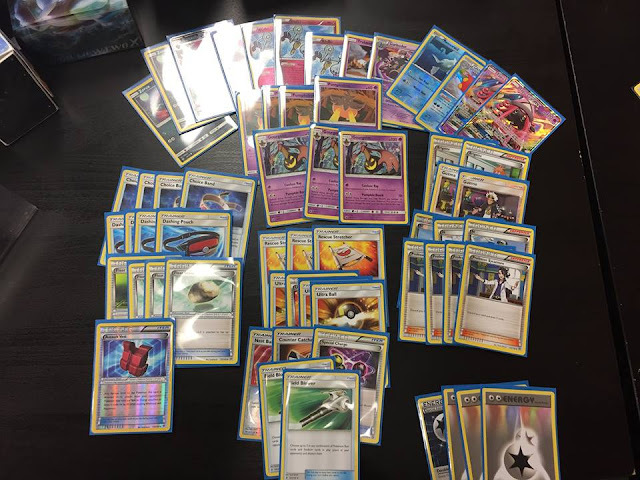 Especially Xerosic"
On Xurkitree: "I feel like it would be helpful against Zoroark decks but unfortunately I ran into a lot of Volcanion and it wasn't useful. It seems like a nice surprise but the deck is already looking to do so much without adding another wrinkle." 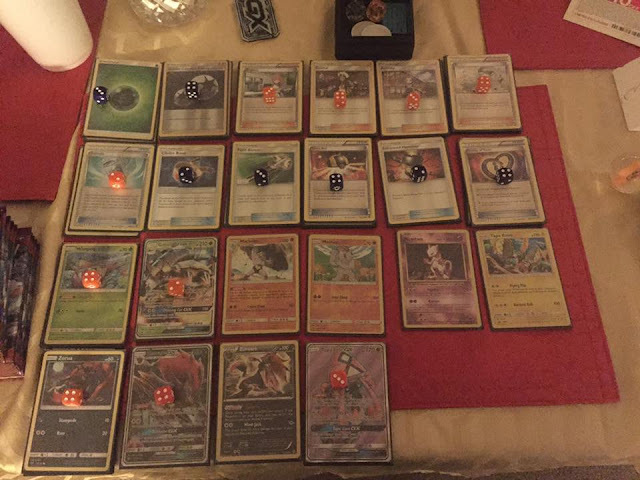 Erratum: a couple dice were placed incorrectly - there should be -1 Wimpod +1 Mallow. "The Machoke was very worth it. I used it against Greninja, Weavile/Noivern spread, and Decidueye/Zoroark. I would have not won finals without it." 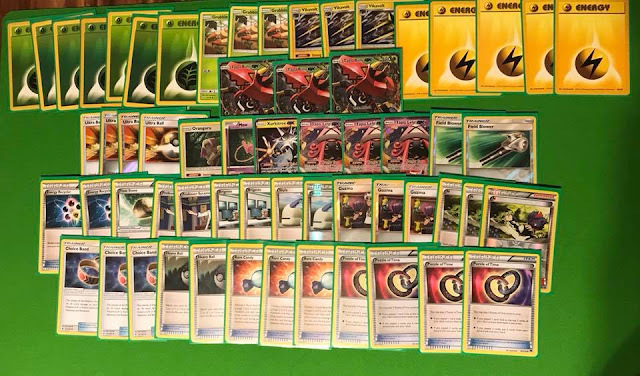 Round 1: Greninja W (1-0) - I whiffed Energy the first few turns, but once I got attacking with a Giratina on the bench, he couldn’t deal with the 'Pods. Round 2: Gardevoir W (2-0) - He never attacked with Gallade so my Enhanced Hammers and Acerolas overwhelmed him. Round 3: Mirror L (2-1)- I’ve never played this deck before this tournament, so I knew any mirrors today would be an autoloss. Looking back, I think that what I did wrong was that I was too scared of Enhanced Hammer, so I was attacking with pod. However, since I had to dedicate resources to attacking with Pod, I couldn’t trade as well, so I wasn’t able to Acerola as efficiently, so my Pods went down and I lost. 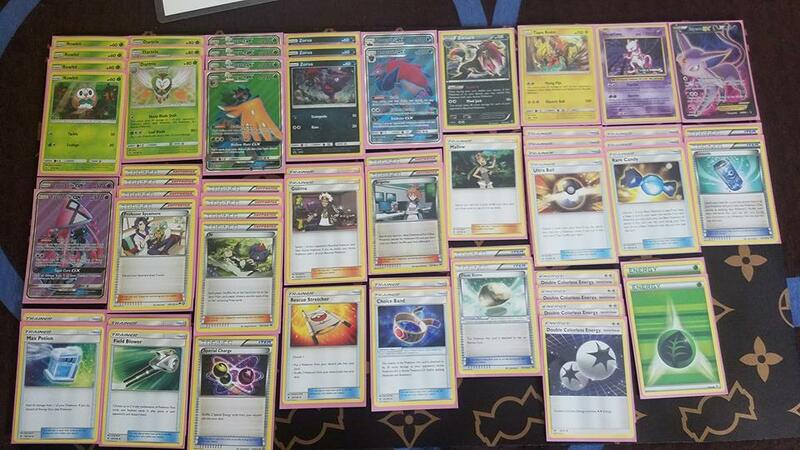 Round 4: Bulu W (3-1) - I picked off his Grubbins before they evolved, so he never got set up. Top 8: Mirror LWL - Pretty much the same thing that happened in game 3. I got a lucky Crossing Cut play to win game 2 though. "Overall, I’m not too disappointed with my result, but I wish I had practiced the mirror earlier in the week so I knew how to play it better. 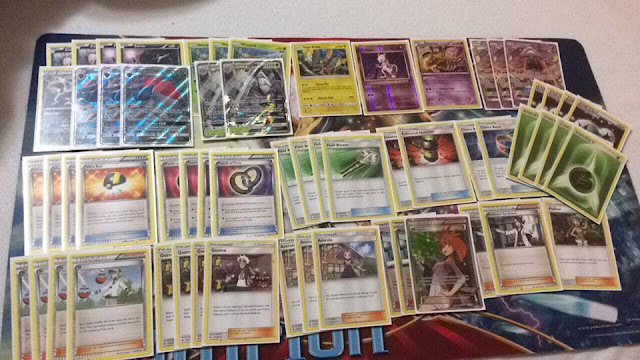 If I were to play it again, I’d definitely try to put in another Acerola. I think one Grass Energy would probably be the best cut."